One of my favourite house purchases is bed linen, and clean bedding night is always a night of the week to look forward to. Generally speaking, I'm not a big fan of anything matchy matchy, weather it be clothes or homeware. Matching shoes and bag? That's on the verge of Hyacinth Bucket territory if you're not too careful. And I extend this theory to my bedding. I like to use a plain-ish duvet cover and pillows set, adding in a pair of pillowcases which are patterned - usually floral, stripes, dots or checks. I think it looks a bit more modern, and a bit less "B&B". It also means that by just buying a pair of new pillowcases, you can really refresh the look of your bed. 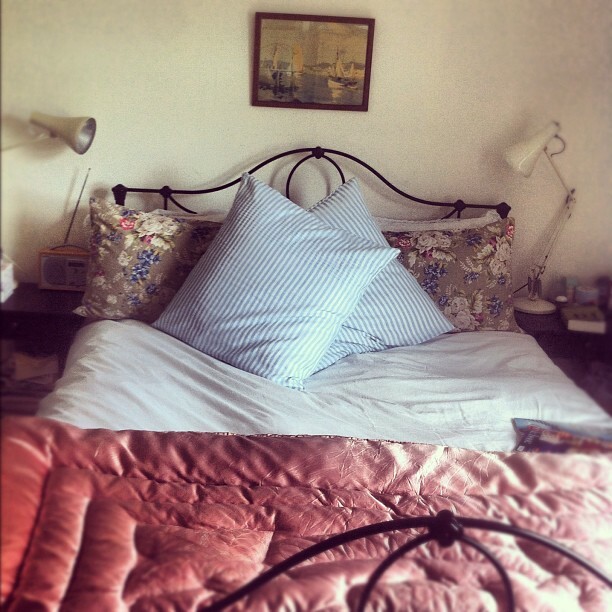 I always have two big cushions or a pair of bolsters on each bed - perfect for when you're sitting up reading in bed. You can get a similar big square cushion (61cm x 61cm) and bolsters from Dunelm Mill, or John Lewis also do a good range - go for feathers for good support. 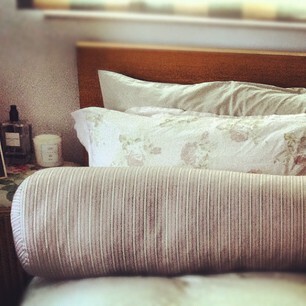 Picture below: plain white bedding by Sanderson, floral pillowcases from Zara Home. 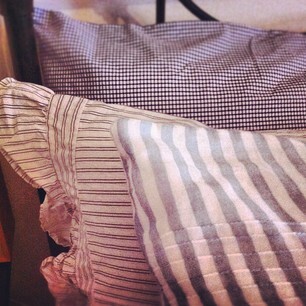 Large striped pillowcases from John Lewis. Picture below: plain IKEA bedding with floral Laura Ashley pillowcases. Covers for the bolsters were made using fabric from IKEA - it was much more easy than I imagined. Picture below: checked pillowcases and striped pillowcases by Ralph Lauren, blue and white striped square pillowcases from John Lewis. 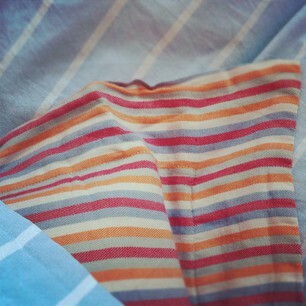 Picture below: blue and white striped bedding from Cologne & Cotton, orange striped pillowcases from The Conran Shop. 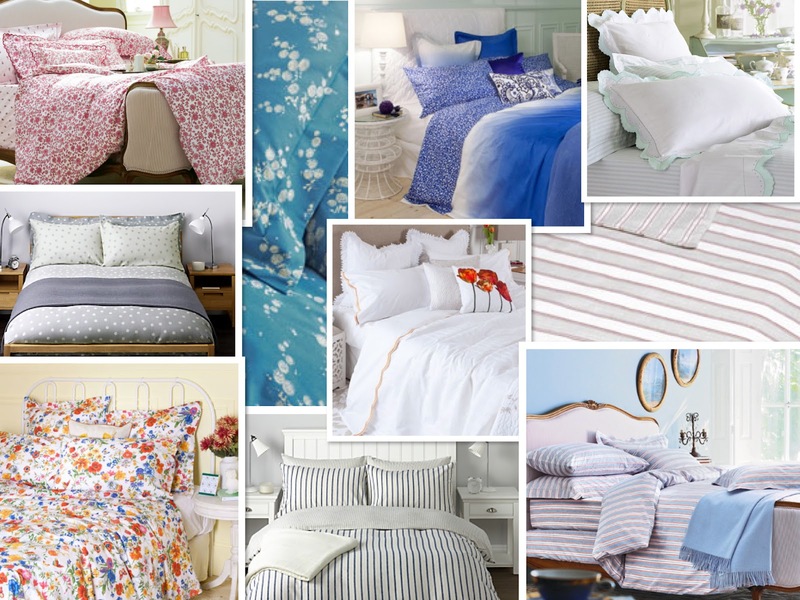 I love good quality bedding - an area I think it's always best to splurge rather than scrimp. The sales make a great time to go bed linen shopping, and so if you're thinking of investing, then now is the perfect time. There's some lovely bedding around at the moment - here are my favourites. Bedding above available from Cologne & Cotton, Toast, Zara Home, Jigsaw and John Lewis. Lemonade Lady - were those Zara home floral pillowcases a recent purchase? I quite fancy some myself! And how about the pink / rose coloured satin quilt in the first photo- I am dying for one of those?! Oh, that quilt was a junk shop purchase a few years ago - it was was a bargain. I got another one in a charity shop in Totnes a couple of years ago. Keep your eyes open in the charity shops because you do occasionally see them. They can go in the washing machine too - just make sure it's a warm windy day so it dries properly on the line, because they can take ages to dry. Or put it in the tumble drier with a tennis ball, so the feathers don't go lumpy. Ebay is probably the best place to look for one - that's where the best choice is these days. Nice bedding products. You can visit dusk.com for luxury white bedding items in UK.